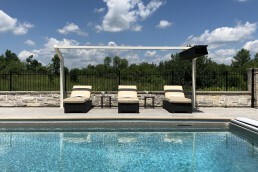 Located in the heart of the Golden Horseshoe, a stretch of land that runs along Lake Ontario’s western shoreline, is the ‘Steel City’ Hamilton, Ontario. The city’s harbour and proximity to the St. Lawrence seaway moulded Hamilton into the industrial-driven city it is today. Responsible for producing over 60 percent of the country’s steel, Hamilton has held the moniker as Canada’s ‘Steel Capital’ for over 100 years. Hamilton holds a second nickname, one that is far less known, the “City of Waterfalls”. Home to over 150 waterfalls, the most to be counted and recorded by any individual city in the world, Hamilton’s harmony with nature may be as impressive as it’s mark in the manufacturing industry. The abundance of falls is a result of its placement along the Niagara Escarpment. Hamilton’s sprawling city boundary includes dense urban development on the bottom of the escarpment, and pockets of rural development on-top. Thanks to its location between the great lakes, Hamilton is a city with one of the most moderate climates in Canada. 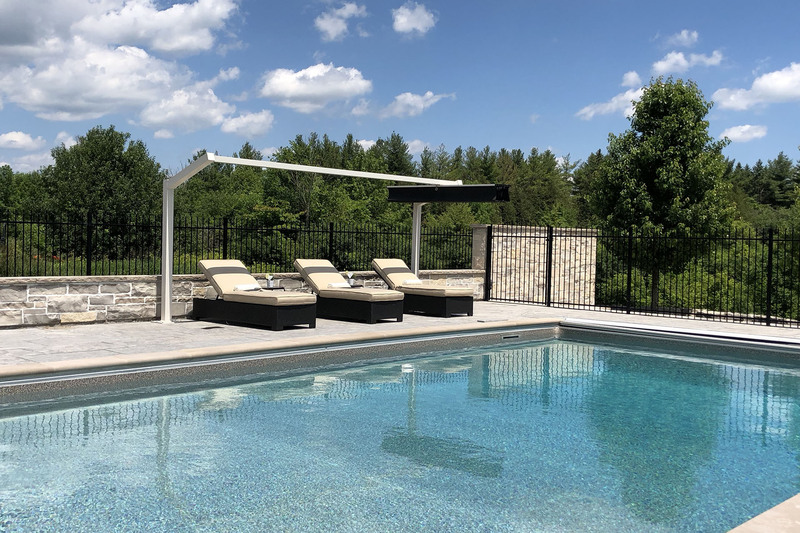 With the appealing weather, residents have more opportunities to enjoy time outside, whether it’s taking in the beauty of those spectacular waterfalls, exploring the city’s scenic forests or catching up on some good rest and relaxation on the backyard pool deck. For those days out by the pool, protection from the sun and its potentially harmful rays should be a #1 priority. 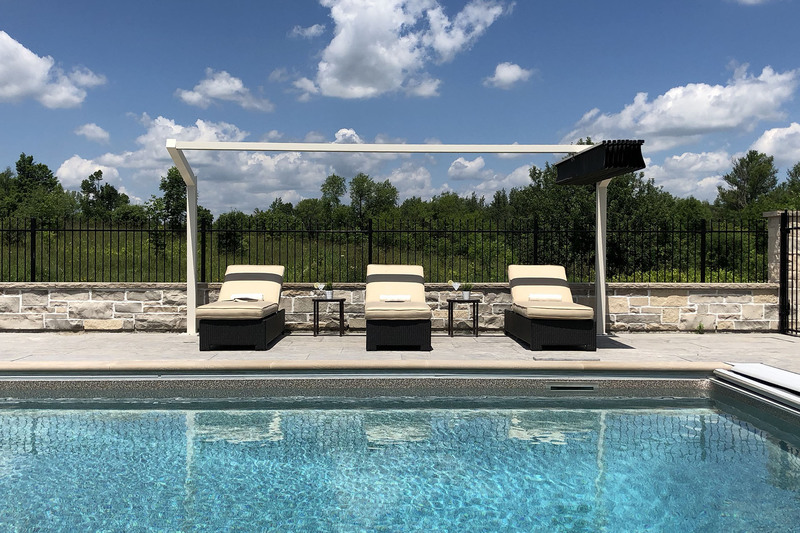 The homeowners of this rural Hamilton residence required a wind-resistant shade solution that provided complete coverage of their poolside loungers while managing the narrow walkway along the pool’s edge. 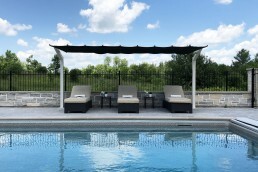 At first, the loungers were shaded with the placement of an umbrella between each seat. This presented a challenge during the late morning and early afternoon, as the sun passed over the home into the backyard. 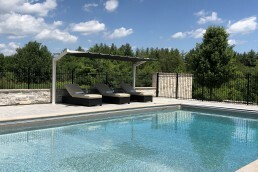 The umbrellas had to be positioned near the pool’s edge to fully shade the loungers. An inconvenience and a hazard for the children playing in the same area. The second challenge occurred during the latter hours of the afternoon, as the sun began its descent over the forest tree line. 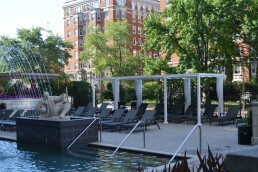 The umbrellas had to be repositioned behind the loungers, often interfering with the retaining wall. A third issue arose during those mildly windy days. 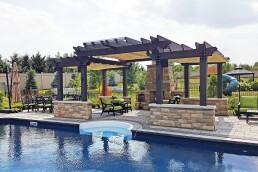 Due to the large open space of the backyard, the umbrellas would topple over at the push of a gentle breeze. 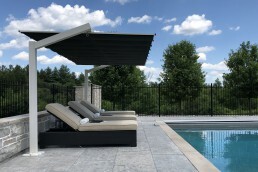 With its sleek, unique two post design, ShadeFX’s Freestanding Retractable Canopy adequately addresses the homeowners’ challenges. 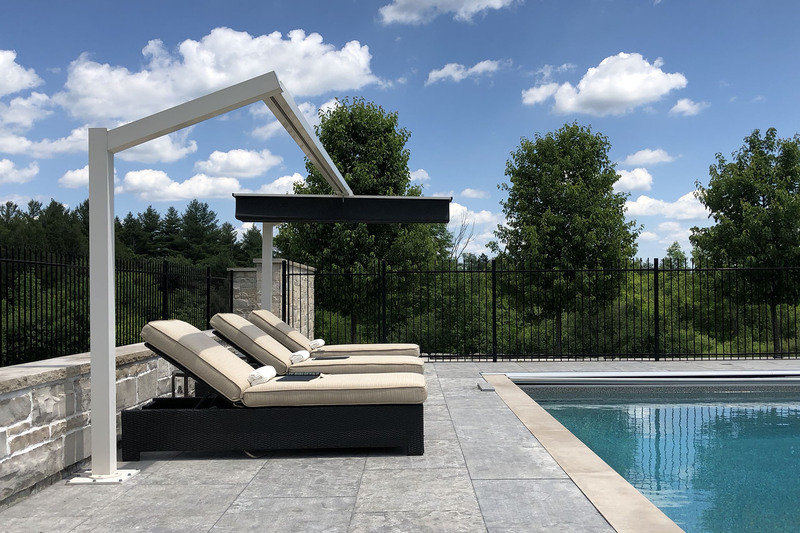 The tall, slim posts allow for the canopy to be fitted near to the retaining wall without interference or obstruction. 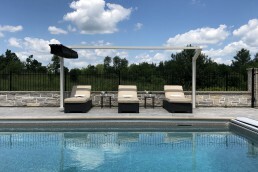 Also, with the ability to tilt the shades 20 degrees from horizontal, the homeowners can now adjust the canopy as the sun passes over the property without having to reposition the posts. 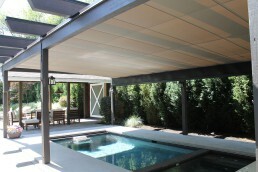 In addition, the canopy is designed to withstand high winds up to 46 mph. 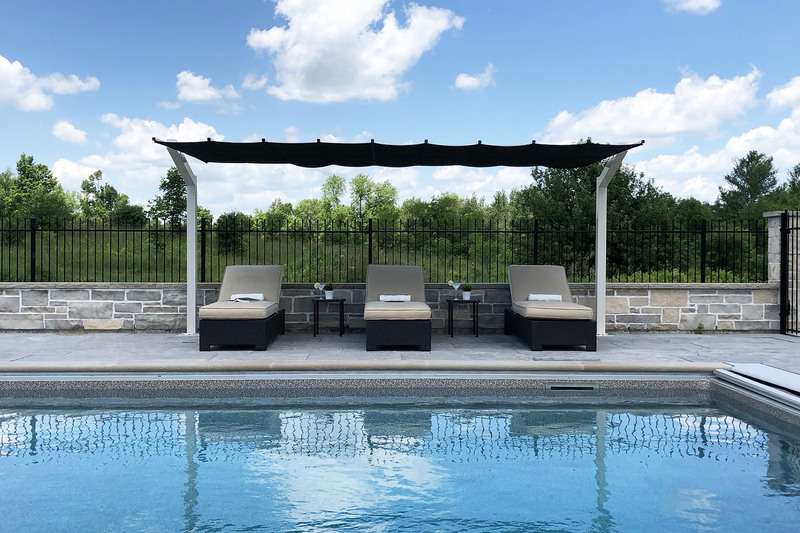 As part of the custom solution, the homeowners elected to paint the structure in a cream colour to complement the canopies and the furniture protected underneath. 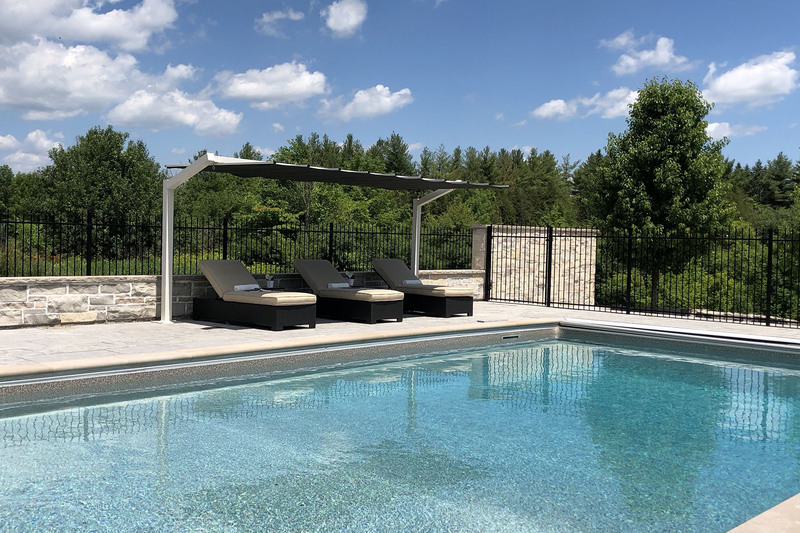 As with all ShadeFX’s products, the freestanding retractable canopy can be partially extended or retracted, depending on preference. By adding one unit at 16ft x 8ft (covering almost 130 sq. 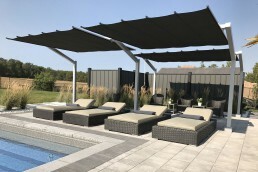 ft.), we were able to provide a versatile, stylish and functional shade solution to an already impressive outdoor space. 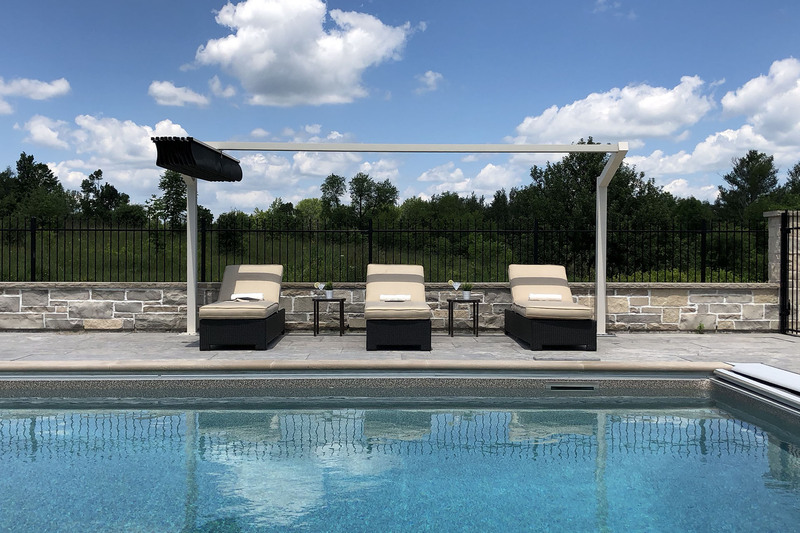 Find out more about our new poolside shade solution. Contact Us.